I can’t believe I’ve already been living in Houston for a whole month! Time has seriously flown by, but not without a bunch of lessons. 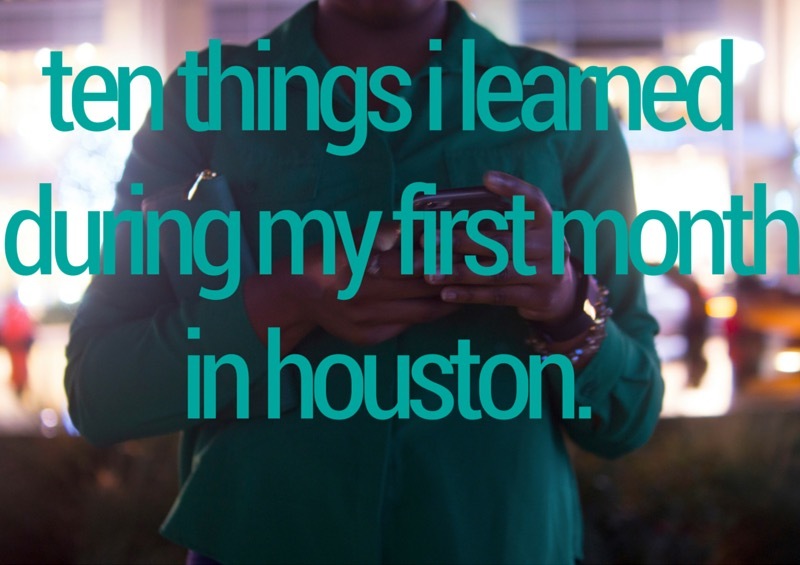 Here are ten things i learned during my first month in H-town. 1. When they say, “Everything is bigger in Texas”, they’re talking about meal sizes. I really try to stay away from fast food, but during our first week here, when we were so busy unpacking and getting our lives together, desperate times called for desperate measures. I’ve heard it’s called the #Texas10 (I haven’t gotten on the scale to check), but literally every meal comes with large fries, large drink, large portions, large EVERYTHING. My boyfriend even asked for a small one time and the worker replied, “Well it comes with a large so…” lol. Long story short, don’t be surprised when you can’t finish a meal. 2. Jack in the Box + What-a-Burger = devil. 3. Every freeway has a name and a number. GPS has been an absolute Godsend since moving to this city of freeways, highways, tollways, interstates, etc. Things get even more confusing when people choose to reference a particular route by its name instead of its number or vice versa. For example, I live off of 290. If we’re going to and from the city, we use 290. GPS calls it Northwest Fwy. AND there are two routes that take a literal loop around the city, so you may be in the loop or outside of the loop, which are also often used as points of reference.